Silhouette Art! You Are Looking for Unique Gift Ideas, Right? If one-of-a-kind is what you’re looking for... You Won’t be Disappointed! A gift that survives, floods, fires, earthquakes, etc. Such a cool gift that memorializes an occasion like no other gift can. This silhouette art may be a little bit extreme, but . . .
Great silhoette art gift ideas are personalized. You pick the theme, and I'll tickle your fancy. Whether Western Home Decor, or Wildlife Decor with Elk Pictures or Moose Pictures, Southwest Decor, Country Home Decor, Lawn and Garden Decor, or maybe a decor theme for a specific room, as in Palmtree Decor, Butterfly Decor, Rooster Kitchen Decor, Horse Decor, Golf Decor or even Coffee Decor. •	Names…Legal, Nicknames, Pet, Endearment, Business, Team, Club, Professional, Title, Place, Occasion, etc. •	Dates…Dates for the following Occasions, Other Significant Dates to be Memorialized, etc. •	Occasions…Birth, Personalized Birthday Gifts for Birthday Anniversary, Naming, Baptism, Rites of Passage, Graduation, Military Service, Wedding, Shower, Housewarming, Wedding Anniversary, Reunion, Retirement, Trip, Promotion, Valentine, Easter, Mother’s Day, Father’s Day, Christmas, Hanukkah, etc. Let's face it, we are talking silhouette art . . . If your looking for male birthday gift ideas, or boyfriend birthday gifts you've struck a winner. On the other hand men, you are on the right track for great unique birthday gift ideas for women. Granted you will probably not want to color it black. Maybe pastel pink? 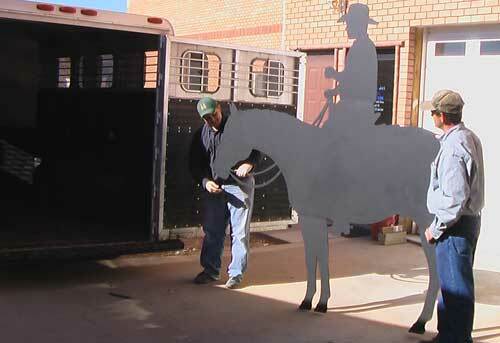 That's the great part about these silhouette art gift ideas. You get to choose. If you are looking for creative gift ideas for graduation, you might wonder if it is good graduation gift etiquette to give a silhouette? Not only is it good, it is a great idea to memorialize this occasion. Whether we're talking pre-school, middle school, or high school graduation gift ideas, or for that matter, college or post graduate gifts, you won't find a match. It becomes a gift that will be passed down to generations. Now that's what I call a great unique personalized gift idea! If you don't want to personalize it, just give us a call, and we will be glad to help you out. Are you worried about a sucking sound around your wallet? No worries. These gift ideas are reasonably priced. Contact Wet Jet Precision, Inc. . . . let's put our heads together, and see what we can come up with!